The origins of Tai Chi are lost in Chinese history with many groups claiming to be its originator. Documentation of some Tai Chi forms has been found in the 1600’s. The Yang forms derive from the 1800’s, while the modern simplifications to the Short Form did not occur until the 1900’s. Qi Gong is a series of approximately 300 different exercises that are designed to promote health and longevity. Emphasis is on the breathing rather than the martial application of the postures. When Qi Gong is done as a group activity, everyone moves at their own pace. What most people think of as Tai Chi is a subset of these Qi Gong movements that have combined into a series of movement. In Tai Chi class, more emphasis is placed on movement and posture that a martial arts application. Another difference is that when Tai Chi is done as a group activity everyone moves at the same pace. There are 5 major types of Tai Chi and countless variations. Different schools of Tai Chi emphasize different aspects of the training. Some schools place more emphasis on the martial arts aspect of Tai Chi while others focus on the healing aspects. Our school places its emphasis on the healing aspects of Tai Chi, teaching a balanced fitness approach to the Yang short form. The slow, gentle bodily motions coordinated with proper breathing can bring benefits to all ages. The no impact format of Tai Chi benefits the entire body, improving range of motion, increasing flexibility, enhancing strength and endurance. Significant improvements in balance are usually noticed within the first few sessions. 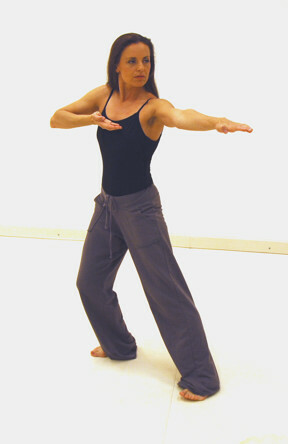 The basic Tai Chi movements can be done by nearly everyone. However, we also have a special modified program that can be done while seated in a chair. While everyone can benefit from Tai Chi, the practice is perhaps most valuable for the elderly, for whom traditional martial arts training is not accessible. The program begins with simplified, basic movements with variations taught for some of the motions to make the postures more challenging for more advanced or athletic students. Tai Chi as been called moving mediation. 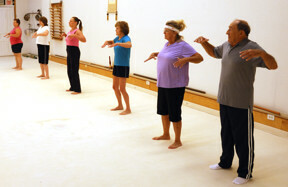 Our Tai Chi classes consist of slow, dance-like motions. Concentrating the mind on the slow motions frees the mind of the worries of the day. No special uniform is required in Tai Chi. However clothing that permits freedom of motion is recommended.